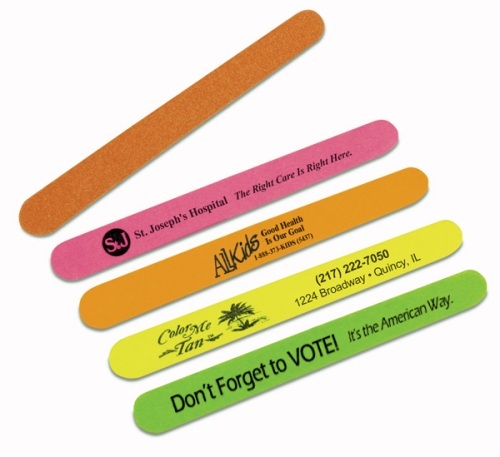 The finger nail file, imprinted with your logo and information is a very inexpensive advertisement. Your custom imprint will give maximum impact and the low cost will allow for a massive cost effective campaign. You can enclose an emery board with a mail campaign. They easily fit into an envelope and will not add to the postage. Give us a call ((706) 374-0710) for a FREE quote and to put our years of promotional and advertising experience to work for you. Our natural, custom made emery boards are high quality, yet provided at discount prices. These emery board nail files are custom made in the USA with your personal message. 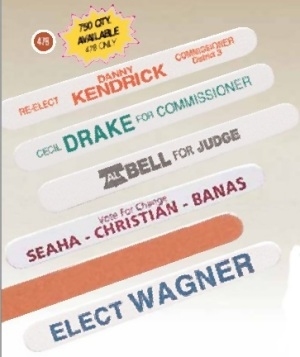 A political way to advertise. 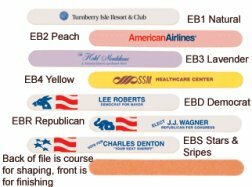 Political and Patriotic Emery Boards, custom made with your message at wholesale prices. To get all the same background neon or pastel color, add $25.00. Shipping and handling is free on quantities up to 12,000 pieces (standard Ground shipping within USA). An additional $30 non-refundable artwork charge must be paid before work can begin.